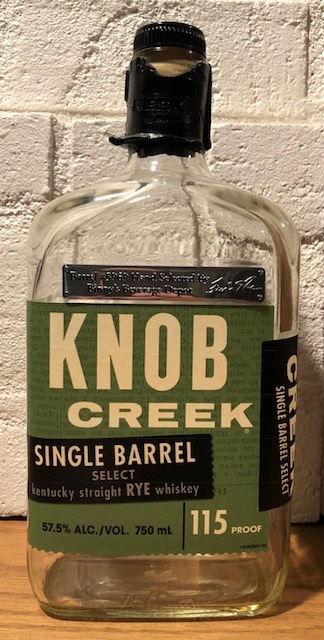 When I first heard via the interwebs that Knob Creek was going to be doing private barrels of its rye, and at 115 proof, I had my eyes and ears open, looking for the first such bottle to make its way to my area. And this was it! I've expressed my love for Knob Creek store picks for a while now. They're always affordable, always good, and sometimes absolutely amazing. Though it cost a bit more than the regular Knob Creek bourbon store picks, I nonetheless had high hopes for this rye. The nose was soft and subtle. I had to work a bit to get any notes, but what was there was sweet and spicy, just how I like my ryes! I got a heavy dose of brown sugar with some vanilla notes backing it. But there was also the slight scent of cloves, hearkening back to my high school days when smoking those things was cool (who am I kidding, they were never really cool). I found the flavor, much like the nose, to be softer and more subtle than expected as well. Although the flavor wasn't bold, it was nonetheless very tasty. It had a lot of vanilla up front, rather than being brown sugar forward like I expected. It also had a kind of custard flavor, not like vanilla ice cream but rather it reminded me of custard pie from Baker's Square, one of their more underrated pies! On the finish I got a light cinnamon note that I noticed at the back of my throat, as well as a bit of peppery spice that stuck on the tip of my tongue and seemed to linger for a bit. As those spices faded, I was left with a nice minty note at the back of my throat that was unexpected and very enjoyable. It was a nice contract to cool my throat after the spiciness from the cinnamon and the black pepper. I can't wait for more of these to come out. This one didn't blow my mind or anything like that. It might have had it been bolder in flavor. But, even with this one being somewhat muted in flavor, what flavor was there was absolutely delicious. It had a great balance of spicy and sweet, with a very enjoyable and complex finish. Even at five dollars more than the store pick bourbons, I still won't hesitate to grab these when they show up. I don't think I'll be able to go wrong with them.